Travelpro's Crew 11 stylish collection is designed for today's frequent traveler who puts a premium on design excellence, quality & durability. The Crew 11 25" Expandable Spinner embodies all of our patented features, such as the self aligning wheels or PowerScope handle with contour grip for a comfortable roll. The intelligent interior features a built-in wet-pocket for toiletries, side mesh accessory pockets for electronics, power cables, cords, and fold out suiter with foam padded roll bars designed to reduce wrinkling. All deluxe features prove the 25" Expandable Spinner is innovative and versatile! My question is about the Travelpro Crew 11 25" Expandable Spinner. How much does the 11.5" width increase when the expandable feature is used? What's the L + W + D total dimensions including wheels and handles? Crew 11 25” expandable. Does the suiter part come out if not being used for a trip? For storage, does the Crew 11 22" Expandable Rollaboard Suiter fit inside the Crew 11 25" expandable Spinner? Is there a lock? Or can you buy one to put on? DOES THIS MODEL COME EQUIPPED WITH A USB FOR CHARGING? 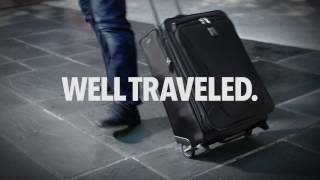 How many pounds does the Travelpro-crew 25" expandable spinner weigh? How are the wheels attached to the suitcase? PROS: Much larger/roomier than expected. Enough room for my wife to take way too much stuff for a 10-14 day trip. Very light weight for its size. Easy to organize. Not sure about durability (it's new and currently on its first trip), but everything else is great. I will definitely turn to them when buying luggage in the future. CONS: No cons with the luggage. PROS: Great thought to creating a piece of luggage that is functional, beautiful and sturdy. Let's face it, you've got to have all 3 for your travel, whether its business or pleasure, for it to be worthwhile. I got the 25" spinner for about $200 on sale. I expect it to last for 10 years or more and have a great warranty to take care of any issues that may arise initially. For frequent and business travelers I would say pay the extra for the Platinum series; for me, who has long left the road warrior mode, this is a great piece of luggage for your money. CONS: Make sure you need a suitcase this big. My wife and I each have one and you can easily fit a weeks worth of clothes in each (I actually carry some of her stuff). PROS: Have not used it yet, but right out of the box you can tell that it is a quality piece of merchandise. I only gave it an overall rating of 4 stars, because it has not yet been subjected to the actual rigors of travel and has not had a chance to prove that it is in fact as good as it looks. PROS: It carries a lot of stuff, the craftsmanship of construction seems good, and there are a lot of well-thought out little details. I also like it that it is Crew 11, and “goes” with my 21 inch Crew 11 Sprinner carry-on. CONS: I think it would cost very little to have a flat panel in the main compartment such as Victorinox has to keep stuff from getting all jostled together in handling. I know that brand costs twice as much, but it’d be a nice feature. I’ve approximated it by using a piece of cardboard. PROS: Spinner wheels, zippers seem to be sturdy, appreciate the capacity. PROS: Quality surpasses anything I have seen in several luggage stores. Im pleasantly, delightefully surprised - durability, looks and large zipper. PROS: At age 70, I needed a piece of luggage that consistently rolls straight, when pushed through the airport. I had a Samsonite that rolled when empty, but was a beast to push when full. I am so glad I spent the money to buy Travelpro. Ordering from Luggage Pros was easy and it arrived undamaged. PROS: After having a TravelPro for many years this spinner does not disappoint. We have been slowly downsizing our luggage for about two years and switching to spinners. This one rolls well and the bright color is easy to spot on a carousel. PROS: I have had several Travelpro products with excellent durability. The only con to my older pieces is their weight. I purchased this case because it is 8 lbs lighter than my older suitcase of equal size. I have not used it yet but the quality and features are great. PROS: Hubby travels a lot - about 200 flights a year. This is the suitcase he likes. They take a fair amount of abuse from Delta so he replaces regularly. CONS: The bag is great, but the pulls go missing with the extensive amount of travel hubby does. PROS: Small on the outside, big on the inside! Great area for suits or dresses, includes wet clothing zippered pocket. Rolls perfect on 4 or 2 wheels! PROS: Does what I hoped in that it is smaller enough to take on business trip but has plenty of space for whole week or more. The suiter holds about two suits and the larger section is very large for other items. The price on the item for the size is excellent deal. The wheels are excellent and much better than many four wheel versions. CONS: The suiter portion is compacted and does create wrinkles but I have yet to find any that don't. PROS: I like the size and space usage, the spinner wheels and its ease of moving, the zipper movement. Product is untested; will use it and see how it performs. Looks easy to pack. CONS: So far, I don't see any difficulties. I'll see how it makes it to France and back. PROS: I like that the suitcase is larger on the inside than it appears on the outside. The rollers make it very easy to move around. You can move it on all four wheels or pull it like a rollaboard. It seems to be very well made and durable. CONS: My old suitcase had three large pockets in the interior and I miss those. PROS: This is the third generation of TravelPro luggage I have purchased over the years. They are always at the top of the list for innovation combined with the toughness that must be designed into air travel. I love the spinner, big upgrade from previous 2-wheeled luggage. They run smooth and easy no matter how you twist and turn. The interior is designed with even more thought and functionality as before. PROS: I used this suitcase for a week long trip. Everything fit in perfectly without overloading it. I especially liked the integrated foldover packer which was great for a couple of dresses or a suit. This spinner is easy to maneuver, although there is a bit of drag when pushing a fully loaded bag on carpet. Buying from Luggage Pros was great, fast delivery and the best price. PROS: First of all I have to say that Luggage Pros is the best luggage retailer out there. Bar none. Fast shipping, outstanding customer service and great prices. I purchase 4 Travelpro Crew 11 suitcases. Primarily because of the magnet tracking system on the wheels that cause the spinner to stay in the direction you are directing them to go. They don't have a mind of their own like our previous set of Samsonite spinners. Which, by the way failed miserably from a quality standpoint. Love TravelPro products and regret ever trying Samsonite! But these, you won't be disappointed. PROS: Appears to be well made. Love the indigo color. I cannot give it an overall rating of 5 since I have not used it yet for travel. I hope I won't be disappointed. CONS: None. I have not used it for travel as yet. PROS: Good brand! Nice size! Will find out how durable it is after some use. CONS: Haven't used it yet! PROS: This rolls so easy, even on carpet in the hotel. Well made. PROS: Spinner wheels with MagnaTrac makes pushing it a breeze. Nylon with coating seems to resist stains & abrasions. CONS: The 2nd pocket on top is too shallow. So there's no much use other than put your small travel documents/tickets etc (temporarily since you have to check-in this 25" bag anyway). The bag only expandable at the bottom but I guess this is to make the bag more stable (not prone to fall down if it's fully loaded / expanded). PROS: The durability, compartments and attractiveness were major features. Probably the single greatest asset was the smoothness with which it rolled. This made packing it full less of an ordeal. PROS: Solid. Easy to maneuver and roll around. Light. CONS: Nothing major. Zippers are a little sticky and not sure if the folded garment section is going to work long term. PROS: Small, new improvements such as sliding straps inside the bag. Travelpro Crew bags have been our go-to suitcase for many years. The wheels do roll straight. CONS: We have only taken one trip with this Crew 11 suitcase so don't know how well it will hold up over time. This was a replacement bag for another less expensive Travelpro bag that was almost brand new ;the zipper broke on the second use with clothes spread across the baggage claim turnstile.